It’s carrot season over here, and my goal is to eat as many carrots as possible until I start turning orange. I usually prefer eating my carrots straight up (even with a little dirt still on them). They taste the sweetest this way. 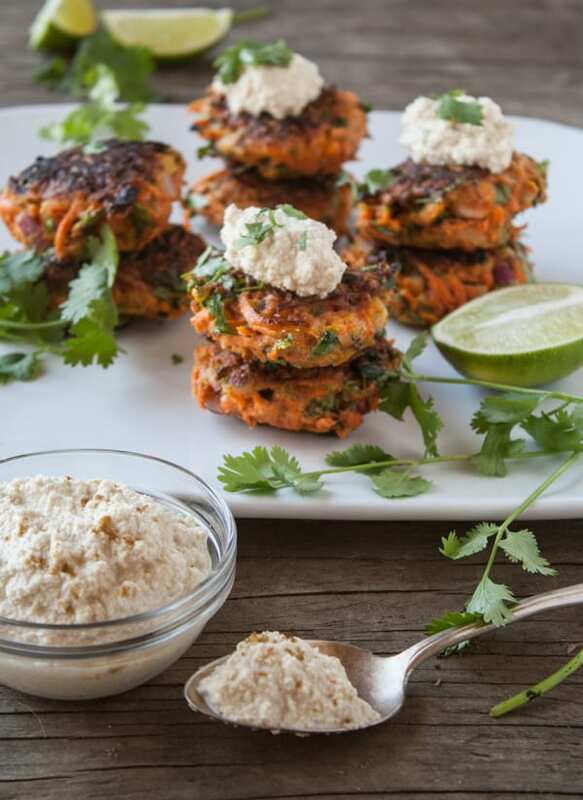 However, a girl can only eat so much dirt, and these carrot fritters with cumin-lime cashew cream are a pretty amazing way to prepare them. 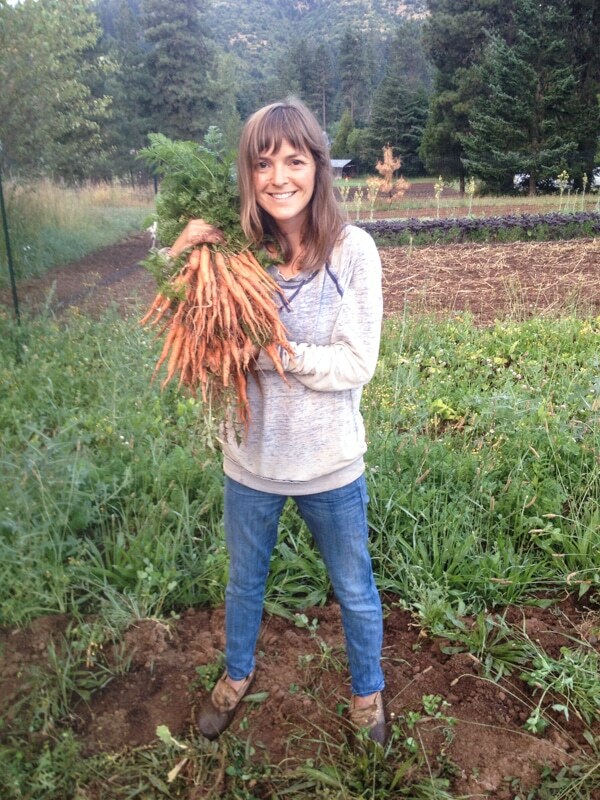 Carrots are one of my favorite crops that my husband and I grow on our farm. Fresh carrots are the best because they tend to be sweeter and crunchier than store-bought carrots. Carrots prefer cooler weather, but can withstand some heat. Since we farm in Oregon, we are able to grow carrots all summer long because it doesn’t get too hot here, but if you’re in a warmer climate, now is the perfect time to start thinking about growing carrots for harvesting in the fall. They can be a little finicky to grow, but if you are working with light, well-drained, fertile soil, they are a great addition to your garden. Besides, if you grow your own you can choose varieties that are just as beautiful as they are tasty — the Colorful Carrot Heirloom Mix from Cubit’s is a great way to try a few different kinds. If growing carrots isn’t a reality for you, don’t worry. Head to your local farmers market and pick up the goods to make these simple and delicious carrot fritters. They are a great appetizer for a dinner party—or a complete meal when served with a side salad and a glass of your favorite wine. Cheers! This post was originally published August 3, 2014. Our recipe tester proclaimed these carrot fritters one of the best things she’s ever made — they’re that good! Prepare the cashew cream by combining all the ingredients together in a food processor and processing until you’ve reached a consistency of whipped cream. Add more water if necessary. Taste test and adjust seasonings if needed. Set aside. In a large bowl combine the shredded carrots, cilantro, chickpea flour, onion, cumin, and salt. Add in the eggs and water and stir until well combined. Heat the coconut oil in a large skillet over medium-high heat. Scoop the fritter mixture into the pan in 1/4-cup portions and lightly flatten them with a spatula. Cook for about 3 minutes per side or until golden brown. Serve with cashew cream and additional cilantro. Yum!! I love all things fritter, but never thought of using carrots. These look great! I looked in my fridge yesterday and discovered I had a huge bunch of carrots from the farmer’s market that I had forgotten about. These look like an awesome way to use them up and it’s great to see some protein in them from the chickpea flour! Most people love zucchini fritters and you make an amazing alternative for them. Now, they’re never be bored by fritters. It’s great option for vegetarian lunch, but what about vegan? In recipe are eggs, if there’s any chance to replace them? You can try substituting the egg with a flax egg. Mix 1 Tablespoon ground flax seeds with 3 Tablespoon cold water. Place in the fridge for 15 minutes before using. Let me know if you give these a try! Thank you very much. It will be very helpful. Not only for vegans but also for people alergic to eggs. Can’t wait to see your other recipes! What a creative and flexible notion! I just made a few for a late breakfast, using what I had on hand — shallots, parsley, ground coriander and tarragon. Didn’t have time for the cashew cream but I’d made a batch of tartar sauce recently and that was a good companion to these delicate fritters. The “flax egg” worked — not quite as binding as an egg but good enough. Great idea. Thank you. We’ve had a fairly mild summer, so I’ve been seeing carrots at the farmer’s market all summer long! I love the sound of these fritters. So much flavor in every bite! I need to grab some carrots from the farmer’s market, because I always get mine at the grocery store, and I’m sure there’s a world of difference. Thanks for the inspiration! I just made these, adding in some beetroot with the carrot shreds. They turn a lurid pink colour, but it’s quite lovely tasting! The lime juice in the cashew cream is really good, what a nice change. Thanks for the great recipe. Absolutely delicious!!! Wholesome, easy, flavorful– these are sure to be a new favorite go-to. Thank you! Can these be baked instead of fried? (trying to avoid the calories of frying while getting in the veggies in a yummy format!) What would be the baking temp and time in that case? Thanks in advance! Thank you!! I made this last night and was hit! i baked it for about 24 mins- 12 mins each side. I would attach a photo if i could in the response! Thanks again! Have been eyeing this recipe for a while and finally made it last night. YUM! Great new way to eat carrots. Whole family liked them. Thank you for the recipe. Such a tasty and easy recipe! thanks so much. I am new to eating clean and really enjoyed this recipe. I’ve made the carrot fritters twice. The recipe worked well for me the time that I followed it and not the time when I substituted another flour for the garbanzo flour and also left out the cumin. I thought the cilantro’s flavor would dissolve when cooking but, it added a nice flavor to the finished fritter. I will be making these again. Thank you!! So, now I have tried the Cashew Cream that goes on the carrot fritters. Being out of cumin I substituted garam masala. This cream is a tasty and goes well with the fritters. Anyone used to Vegan fair will find this to be amazingly rich and delicious. The lime juice plus the fat and creaminess of the cashews and the garlic combine to hit similar notes as real (not Tofutti) sour cream. I am used to animal products and still prefer sour cream a little bit more (but this is way better than Tofu Sour cream). I am thinking I may mix a tiny bit of real sour cream into my cashew cream in the future. I used a Vitamix to get the creamy texture. It was delicious enough that I had to get every last bit of it out from under the blade before washing the Vitamin. Thank you for another well thought out recipe!! I didn’t have any cilantro so I substituted arugula and these were AMAZING. I can see myself dolloping that cumin-lime cashew cream on pretty much everything. Thank you! This recipe is a keeper — the 7-year-old ate 4! I would ideally like to see them a bit crispier, but can’t think of how to do that. The besan flour worked wonderfully to make this GF. Batter looked too loose and I was tempted to add more flour, but glad I didn’t as it cooked up perfectly. What can I substitute for the chickpea flour? It’s the only thing I don’t already have. Thanks! You might be able to get away with all-purpose flour, but we’ve only tested the recipe with chickpea flour, so we can’t guarantee it will work.